Home and Commerical Restorers tired of waiting for full economic recovery forge ahead. For us sales slowed considerably after Sept 2008 but they are now gaining steam again picking up the last half of last year. So far this year sales have been good too, giving us the opportunity to reinvest in a few projects. Especially excited about the camera settings that allow the capture of the natural light. The subject matter isn’t bad eigther. Number 651 (as referenced in the Bradley and Hubbard catalog) just hung today. I’m already too attached to this one. You can click on the above picture to enlarge. The amber flicker of a flame is healing for the soul. 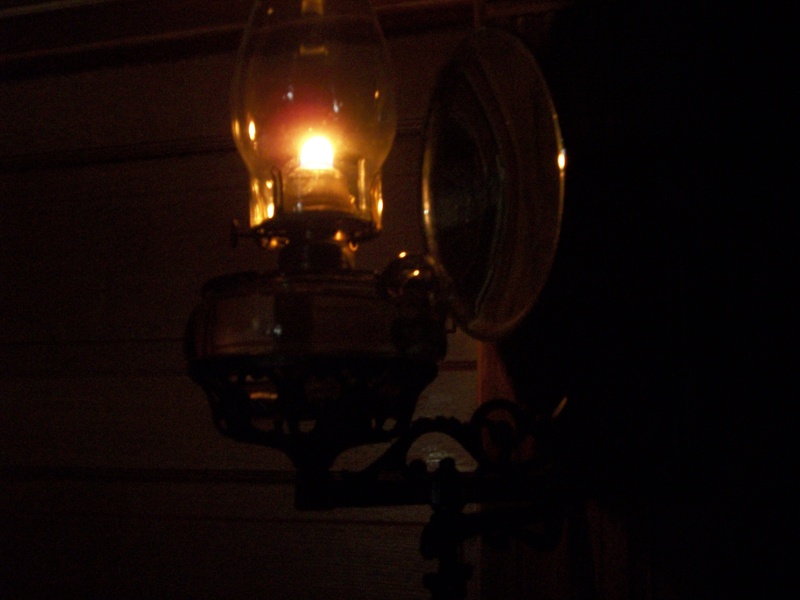 The atmosphere a real kerosene lamp brings to a room in the evening hours cannot be duplicated. In our world of dead lines and noise the flicker of amber flame quiets the soul. The bracket lamps of the 1870’s and 1880’s represent the finest in artistic expression as well as the twilight of an era. Slowly we have traded our quieting yellow for a disturbing blue flicker. Time to think without distraction can be frightening at first (especially if we aren’t used to doing it) but those that dare to do it are rewarded with quiet contentment. Find an old book of matches from some little business in your home town. Find an old book you have been wanting to read for a long time. I dare you to light the wick. Let me know how it goes. 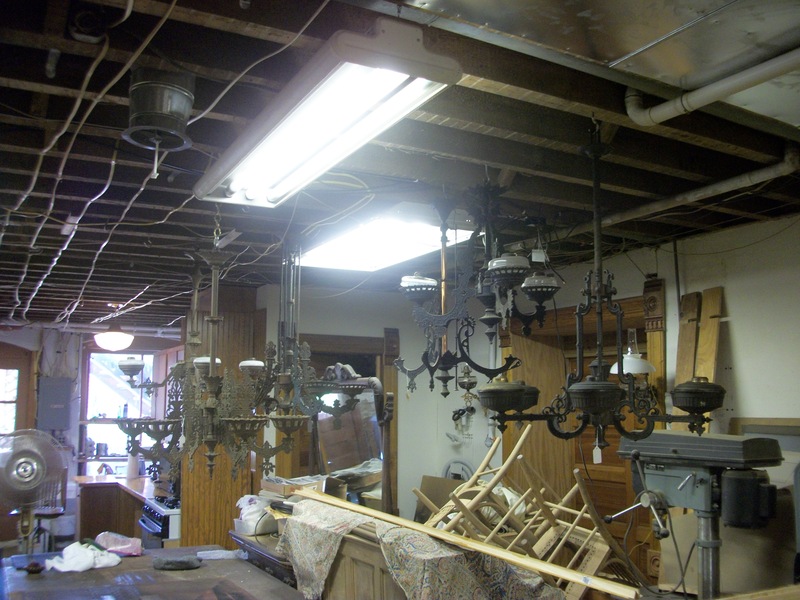 This light is an example of what kind of condition the lights are often in when they are brought to us for restoration. Have you ever took something apart thinking… “I’ll remember how this goes.” Then when you go to put it back together, it starts looking really strange. These lights are the same way, they are like putting together a puzzle. One little piece wrongly placed or upside down on the center stem… and everything else is out of place and cast iron just doesn’t bend. We have already started restoration on this (it had about 6 coats of paint on it!) I’ll post a pic of it when it is complete. Well from there the light was completely disassembled and bead blasted. You are never sure what you have until this process is completed. There were a few damaged pieces, so a visit to our parts department once again proved to be the difference between having a light done wrong or an authentic restoration. 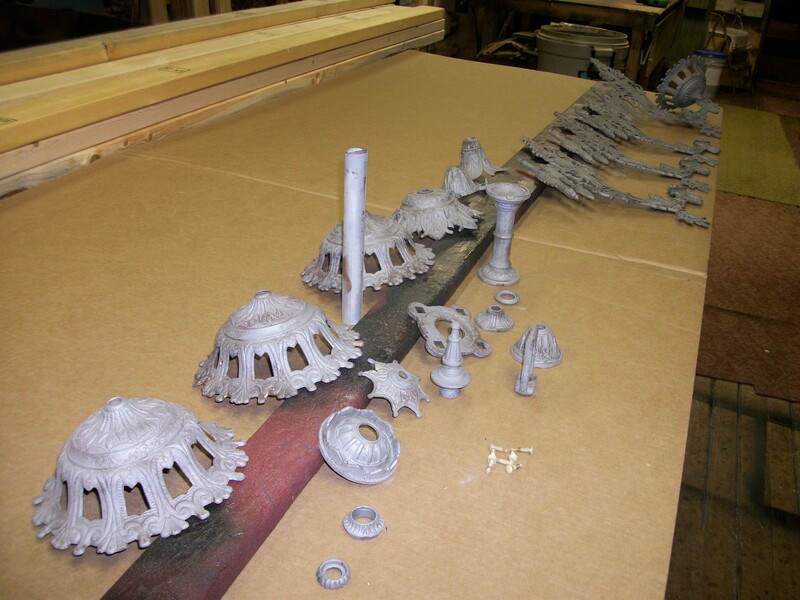 Below are two pics of the light in pieces and ready to begin the finishing process. 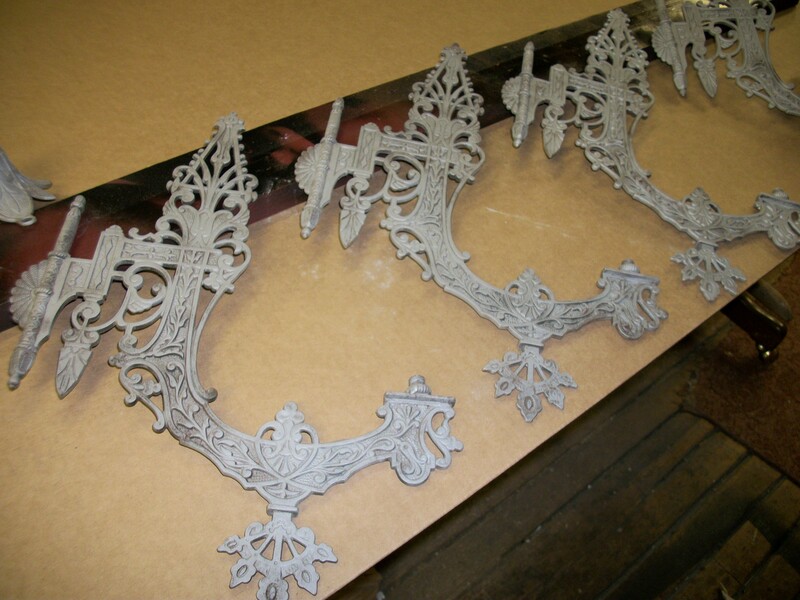 After running each piece through the finishing process – time for assembly. You will notice high quality brass fitters are used. This customer already had glass to install on the fixture, so the glass on the lamp in this picture is for illustrative purposes. 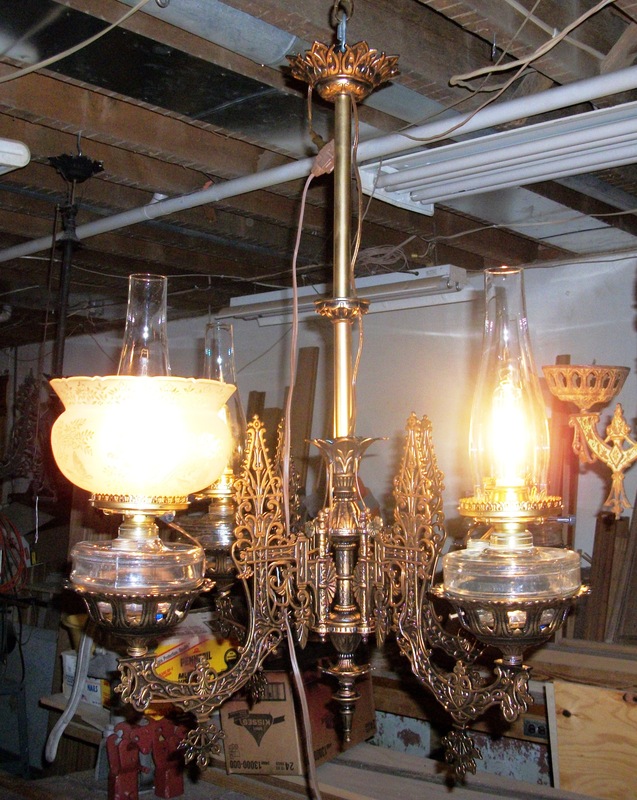 Click or Copy and paste the link below into your internet browser to see 150 plus pictures of lamp inventory. I am a purist. 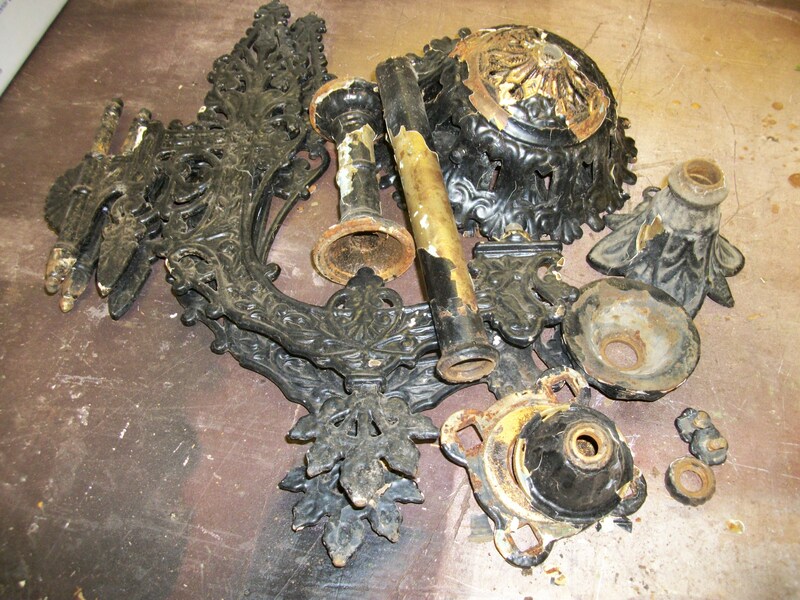 Authentic restoration of fine architecture is a commitment to a sometimes very difficult process. Anybody can go to the lumber yard or lighting supply store and buy a board and cut it to fit, or buy a light and hang it. What sets a restoration apart from a remodel or more accurately a remuddle job is a solid sustainable commitment to respecting the integrity of the original design. Walls begin to talk, woodwork warms and fixtures dance with historical significance. An authentically restored home or commercial building tells a story you want to hear again and again. Preserving America’s architectural past has become a passion of mine. It requires a commitment to a process that takes a lot of years, patience and drive. 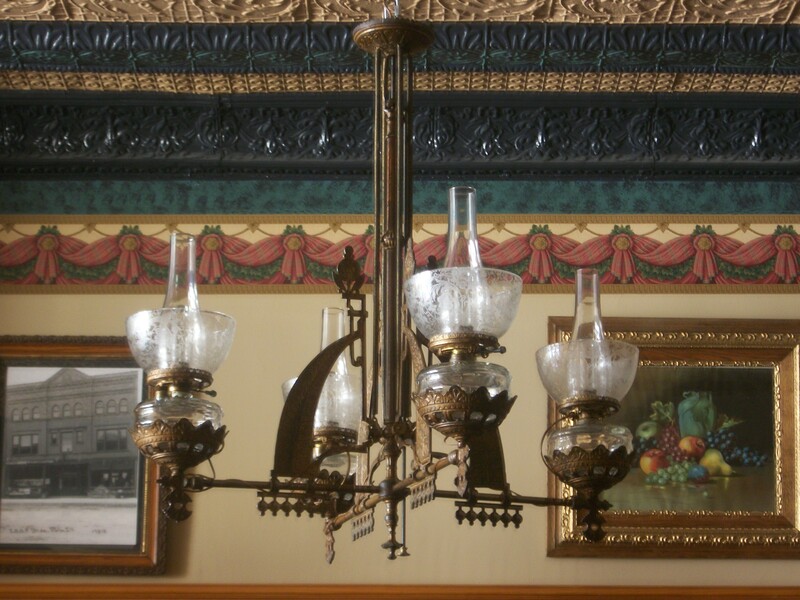 The Bradley and Hubbard Cast Iron Kerosene lights that this blog is named after have become what I believe to be the missing link in homes built during the 1860’s – circa 1910. Very few authentic examples exist today. Many were broken and turned in for scrap during World War II because of the need for iron to build military equipment. My dad got me started on this passionate crusade to locate, restore and use these unbelievable lamps. My dad has been collecting and restoring these lamps for 35 years. I invite you to join in on this treasure hunt. Please write and let us know your story.